A function, postResample, can be used obtain the same performance measures as generated by train for regression or classification. caret also contains several functions that can be used to describe the performance of classification models. The functions sensitivity, specificity, posPredValue and negPredValue can be used to characterize performance where there are two classes. By default, the first level of the outcome factor is used to define the "positive" result (i.e. the event of interest), although this can be changed. The "no--information rate" is the largest proportion of the observed classes (there were more actives than inactives in this test set). A hypothesis test is also computed to evaluate whether the overall accuracy rate is greater than the rate of the largest class. Also, the prevalence of the "positive event" is computed from the data (unless passed in as an argument), the detection rate (the rate of true events also predicted to be events) and the detection prevalence (the prevalence of predicted events). When there are three or more classes, confusionMatrix will show the confusion matrix and a set of "one-versus-all" results. For example, in a three class problem, the sensitivity of the first class is calculated against all the samples in the second and third classes (and so on). Also, a resampled estimate of the training set can also be obtained using confusionMatrix.train. 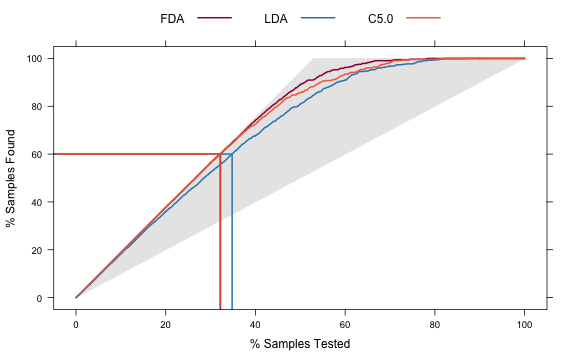 For each resampling iteration, a confusion matrix is created from the hold-out samples and these values can be aggregated to diagnose issues with the model fit. These values are the percentages that hold-out samples landed in the confusion matrix during resampling. There are several methods for normalizing these values. See ?confusionMatrix.train for details. The package also contains two functions for class probability predictions for data sets with two classes. The lift function does the calculations and the corresponding plot function is used to plot the lift curve (although some call this the gain curve). The value argument creates reference lines. From this we can see that, to find 60 percent of the hits, a little more than 30 percent of the data can be sampled (when ordered by the probability predictions). 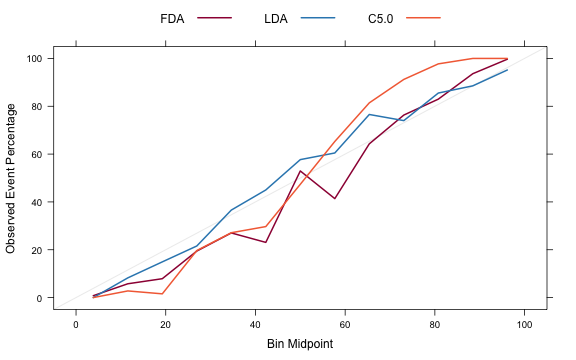 The LDA model does somewhat worse than the other two models. For Affymetrix gene chip data, RMA processing (Irizarry, 2003) is a popular method of processing gene expression data. However, for predictive modeling, it has a drawback in that the processing is batch oriented; if an additional sample is collected, the RMA processing must be repeated using all the samples. This is mainly because of two steps in the processing: the quantile normalization process and the calculation of expression. Quantile normalization normalizes the data such that the between--chip distributions have equivalent quantiles and is very effective in improving the quality of the data. It is possible to let the samples in the training set define the reference distribution for normalization. For the expression calculation, a robust method such as a trimmed mean can be used to summarize the probe level data into a single summary metric per sample.